From Tynecastle to Rugby Park, then to East End Park and now Bayview. Scott Robinson’s descent through Scottish football has been steady. The Evening News finds him playing part-time in League One with East Fife – “a setback” by his own admission – but enjoying himself enormously. He still harbours hope that he can return to full-time ranks. He has purchased training poles, cones and markers to train full-time by himself through the week despite his club’s part-time status. It is that desire, allied to scoring goals from his preferred attacking midfield role, which give Robinson a genuine chance of moving back up the divisions. It is startling to discover that he is still only 24. He seems to have been around longer than anyone since his Hearts debut in 2008 at the tender age of 16. He was released in July 2015 and spent a season at Kilmarnock before two games for Dunfermline as an amateur. East Fife signed him last summer and he instantly became a key player. Three winning goals in his last four appearances for the Methil club exemplify his importance. The tenacious approach aimed at earning a move back to full-time football is paying off. “I still train as if I was full-time,” says Robinson. “I train myself on a Monday and I make sure I’m doing a really hard session. East Fife train on a Tuesday and I take a Wednesday off because that’s what normally happened at the full-time clubs I was at anyway. East Fife train again on a Thursday and then I do a wee bit myself again on a Friday. That’s my normal week through to matchday on a Saturday. “I bought myself some training poles and markers so I could work on my own. I do long-distance running and some shorter sprints. I mostly do that on a Monday, that’s a big day for me. You know me, I’m really hungry to do the best I can. I think I’ll have a problem if I lose that. To do so, Robinson feels he must address a perpetual myth: He is very much an attacking midfielder, not a defensive one. “I’m now playing in my favourite position,” he continues. “Remember when I first broke in at Hearts and I was playing behind the striker? I’m now back to that and I’m loving it. He recalls why he ended up playing in the holding position. “John McGlynn and Gary Locke took over at Hearts and I did well in a couple of pre-season friendlies in that defensive role. I think they thought that was my position, but I didn’t think so. I never liked it there. 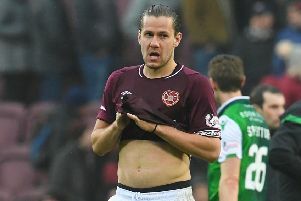 Are there regrets at going from boy wonder to outcast at Tynecastle? Robinson became the youngest player to make a competitive appearance for Hearts when he came on as substitute against Inverness just one month and 14 days after his 16th birthday. “I wouldn’t say I have regrets as such. I played over 100 games for Hearts, won the Scottish Cup, played in a League Cup final and a couple of semi-finals,” he recalls. “I might not have done that if I wanted to play that more advanced position. At the time, Hearts didn’t have anyone to play that defensive role so I had to do it. He is certainly doing his best to create awareness with his goals for East Fife, helping them push for a League One play-off spot. “Part-time football was quite a change to start with but you get used to it. “I picked up a groin injury which set me back to start with but I think it’s fully sorted now, so I’m really enjoying it here. It can be a bit direct at times at this level, which is fine, so you need to play to the conditions and the pitch. It has been quite the start for new manager Barry Smith, who succeeded Gary Naysmith when he joined Queen of the South last month. “Just before Gary Naysmith left, he had a meeting with us. He gave us a harsh talking-to,” says Robinson. “It was, ‘if you don’t get your act together, there’s going to be changes in January’. I was injured but I remember sitting at the meeting. “He moved to Queen of the South the next week and since then we’ve gone on this run. We didn’t have a manager on the Saturday at Brechin but we sat down and said: ‘Look lads, we just have to be in this for each other because we don’t know who the new manager will be or when he will come in’. We said our aim was just to try and stay in the league.